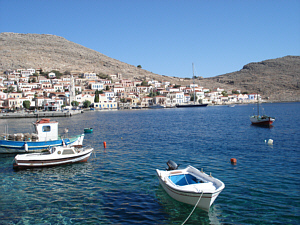 The tiny island of Halki lies off the west coast of Rhodes in the area of Greece known as the Dodecanese. It has no airport, and access is by ferry alone. This means it has managed to preserve much of its traditional peace and tranquillity. The sea crossing from Kamiros Skala (the small harbour on Rhodes 30 minutes from the airport) takes between 45 – 75 minutes depending on the ferry. It is like a trip back in time. Nightlife is limited and car or bike hire non-existent. 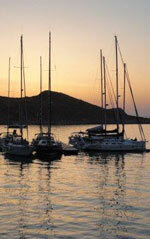 If you are looking for a beautiful, quiet, relaxing and friendly Greek atmosphere then Halki will enchant you. 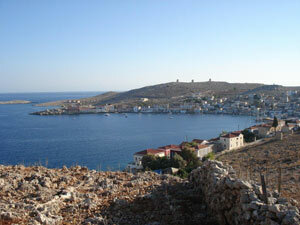 In recent history there were two main settlements on Halki, the old village (Chorio) and the harbour area (Emborio). The Chorio, located beneath St Mary’s Church and the Crusader Castle, is now largely deserted, with Emborio being the centre of island life. 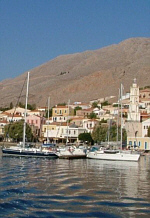 Since the village is so small, the natural amphitheatre of the harbour is where life takes place, and most of the shops, bars and tavernas are located there. 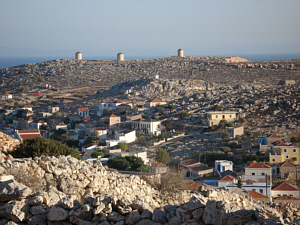 Halki has a small local population of approximately 300 people. This means that during your stay you will become familiar with various village characters and friends with the proprietors of your favourite bars, tavernas and shops. You will find a warm welcome from everyone. The setting is authentically Greek and the greeting you receive is genuine. There are a variety of tavernas located around the harbour area (called ‘Piazza’ by the locals), and one at each of the main beaches. The food served is mostly traditional home-cooked Greek food with a variety of meat and fish dishes. Vegetarian options are always on offer, and some restaurants do Greek-style fast food as well. There are also several cafes which serve Greek sweets, cakes, ice-creams and other snacks in addition to all kinds of drinks. Emborio has quite a wide variety of shops for such a small island. There are several mini markets, an excellent bakery and various different places to buy souvenirs. Together the shops provide for almost everything you might need during your stay, and if they don’t have something to hand they will always be happy to order it for you from Rhodes. There is a Post Office, open every weekday morning, and an ATM, both located on the harbour front. There is also a small medical centre in the village. Not all of the shops and tavernas take credit or debit cards, so it’s best to be prepared. Cash and travellers’ cheque exchange is possible at the boat ticket agency on the harbour front. The village church is dedicated to Saint Nikolas and is well worth a look inside. It is beautifully decorated and rich in the atmosphere of the Greek orthodox faith. 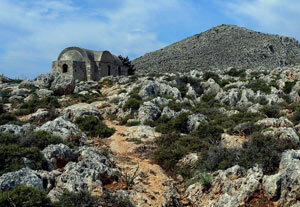 There are also several other small monasteries within easy reach which merit a visit. 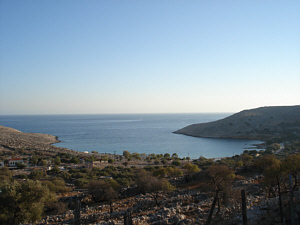 Halki has its own minibus operating a useful service to 3 beaches (Pondamos, Ftenayia, and Kania), the hotel, up to the old village and Crusader Castle, and further afield to the Monastery of Saint John. In addition to the minibus the island has a small minivan and a regular taxi for hire. There are two popular beaches within easy walking distance of the Nikitas Apartments, Villa Yorgos and the Halki Townhouse, these are Pondamos and Ftenayia. Both have sunbeds and a taverna. The beach at Kania is about 40 minutes walk away (or 10 minutes on the bus) and is smaller, but brilliant for snorkelling. 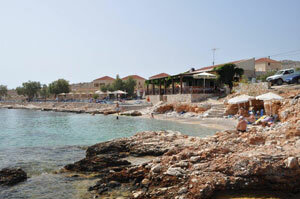 It has sunbeds and a taverna serving food and drinks. 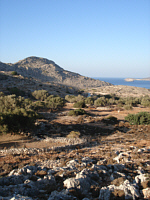 Spring and autumn are particularly popular times for walking on Halki. The old village beneath the crusader castle and the Monastery of St John are two of the most well-trodden paths, though they both require stamina! 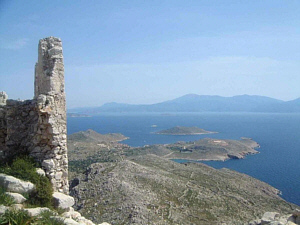 The crusader castle is an impressive sight from below and repays the exertion of the climb up with fantastic views of Halki and the islands over to Rhodes. On a clear day you can even see Karpathos in the distance. 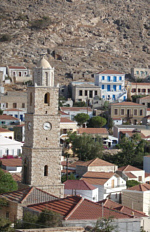 The Monastery of St John is one of Halki’s most special places. 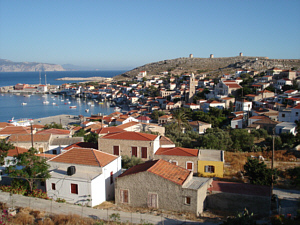 It lies at the farthest point from Emborio harbour at the end of Halki’s only road into the mountains. 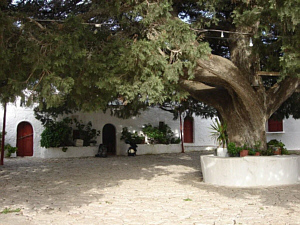 The church itself is small but has beautiful icons inside, and the courtyard with its ancient pine tree and the surrounding monks’ cells, is a wonderful place to experience the serene atmosphere of the monastic setting. 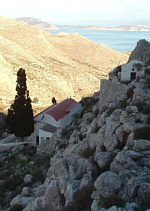 For the adventurous and fit, the Temple of Apollo above Kania is well worth the effort of the clamber up, and provides a keen sense of Halki’s pre-Christian past.